Shruti's Blog: If appams come, can eshtu be far behind? Some weeks ago I posted my appams recipe Laced to Perfection. While I did feature the stew in the photos, I was so enamoured by the lacy appams that I forgot to click a better photo of the eshtu. By the time I realised it, I was too busy pouring and swirling more hot lace appams for the family, so the eshtu remained on the back burner- in its own juices - and eventually was polished off. The following day I made some more eshtu and took some photos – but had this compulsive need to feature them with appams, but this time there was hardly any batter left. But what is eshtu without appam, so here it is, with the almost-exhausted -batter- extended-with–water- and -rice flour kind of appams in the background. 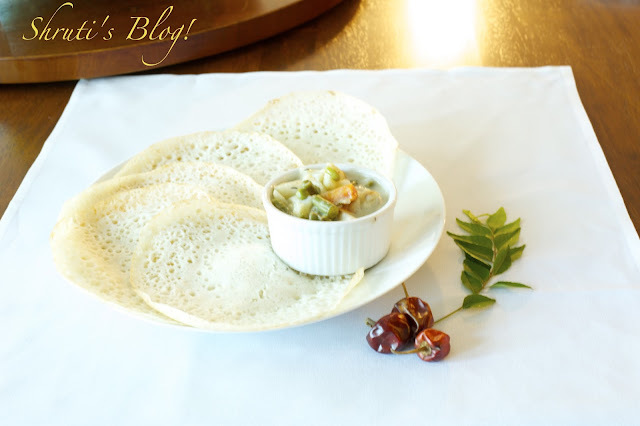 The truth is, appam and stew is a match made in heaven – or in God’s Own Country? Heat oil or ghee in a heavy bottomed vessel. Add cumin, cardamoms, cloves, pepper corns, red chillies and cinnamon and sauté for a few seconds. Add sliced onions, grated ginger, garlic and green chillies and half the curry leaves and continue to sauté till slightly browned. Add the cubed potatoes, carrots, French beans and peas. Mix until the vegetables get coated with the oil and spices. Add a cup of hot milk or boiling water and let it cook till almost done. Add more water as required. Add some salt. Now add the coconut milk and let it simmer on low-medium flame for a few minutes. Adjust salt and add rest of the curry leaves. Simmer for a minute or two and remove from heat. Serve with appams or idiyappams only. But if you want to be heretic, you can serve it with dosas, chapatis, pooris or your everyday chawal. Makes a lovely party dish, too.